More than a third of American adults are falling short on Zs, which can have serious long-term health repercussions. 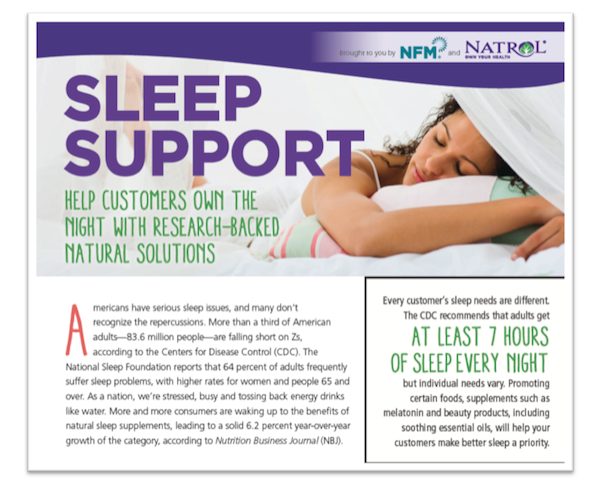 As a result, more and more shoppers are waking up to the benefits of natural sleep supplements, leading to 6.2 percent year-over-year growth of the category. Here, we outline the key benefits of getting more rest and what your staff should know about the category's key player, melatonin. • Key stats about sleep issues in the U.S.
Also, click here to share this educational eGuide with your customers; it explores natural tips for better sleep.